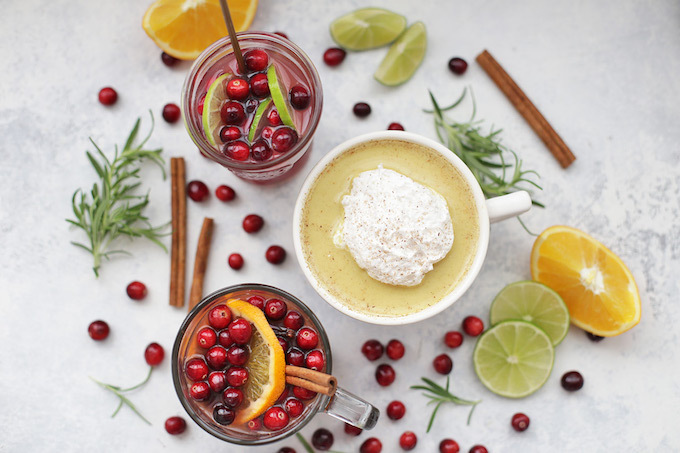 Superfood Holiday Drinks – Feel all the holly jolly, very merry feelings as you sip these superfood holiday drinks this season. Great tasting drinks that love you back! This post is written in partnership with Sprouts Farmers Market. Check out the Facebook Live we did together where I made the drinks in real-time! What are your holiday plans this year? We’re keeping things fairly low-key–no fancy dress-up parties to attend, and no traveling. But that doesn’t mean we aren’t celebrating! We’re home for the holidays this year, so we’re doing everything we can to make them special. 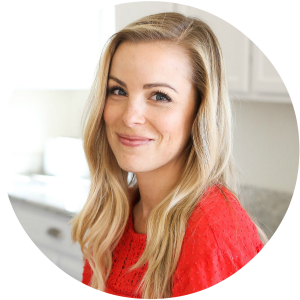 Today, I’m sharing three superfood holiday drinks. 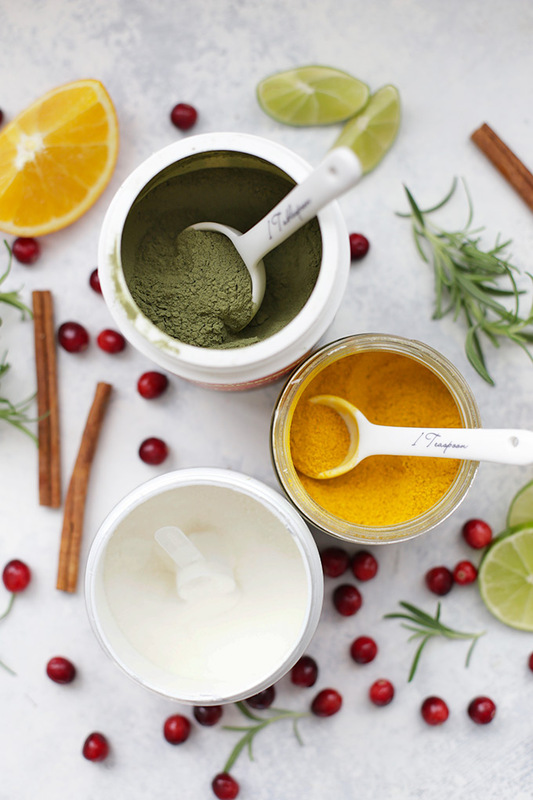 They’re made-over versions of holiday classics with a superfood boost. They’re all kid-approved, husband approved, and they make the season bright indeed! First up is this Cranberry Lime Spritzer. It’s a sparkly little mocktail that’s naturally sweetened (no added sugar!) and tastes amazing. It’s the perfect blend of tart, sweet, and sparkle. We do a dinner of appetizers and finger foods Christmas Eve, and I’m already planning to serve this with it. It’d also be fabulous for New Year’s Eve to toast in the New Year with little ones, or for any of the many holiday parties throughout the season. First off, it has a dose of natural antioxidants from the cranberry pomegranate juice, and second, it has protein in it! Yes, I’m serious. 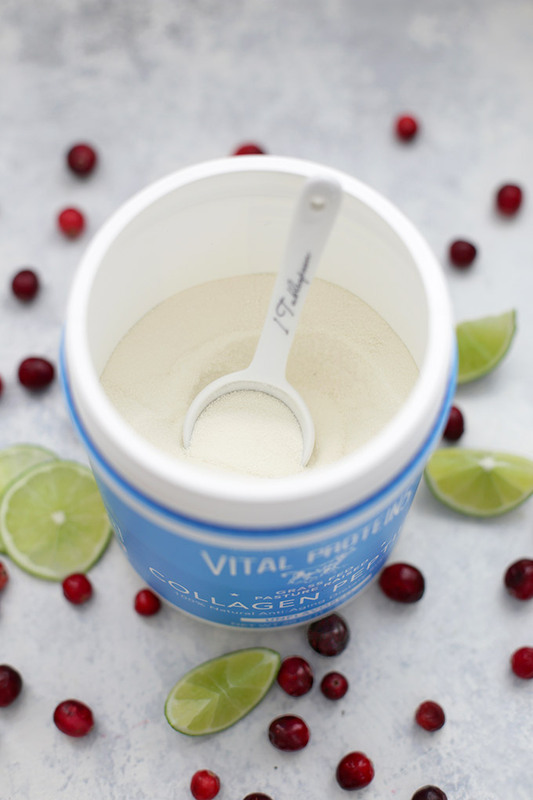 If you’ve been following along for the last few months, you know I’ve been adding collagen to all kinds of things. It’s a really high quality form of protein (dairy free, but not vegan) that is completely flavorless and odorless. It dissolves in cold or hot liquids, so you can mix it into anything–a bowl of warm oatmeal, a smoothie, homemade hot chocolate, juice, or a fun little mocktail like this one. The best juice blends. You can use many kinds of juice for this spritzer. I used cranberry-pomegranate for the photos, but I’ve also tried cranberry-blueberry and blueberry-pomegranate. I just love something with a little sweetness to balance out cranberry’s natural tartness. If you prefer to use straight cranberry juice, you may need to add a little sweeter (honey, sugar, or stevia) to offset the tartness. And for a little sparkle… You can change this up by using different flavors of sparkling water. I like something with lime to boost that citrus factor, but you could certainly use something lemon, berry, orange, pineapple, or peach! Alternatively, you could certainly use soda instead of sparkling water if you prefer. (Ginger ale is nice). Combine all ingredients in a pitcher. Stir with a spoon or stirrer until well combined. 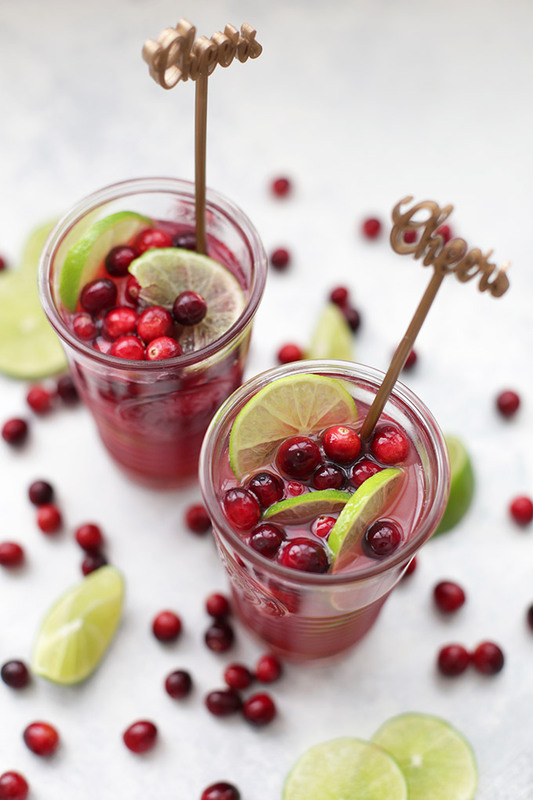 To serve, pour spritzer over ice and garnish with fresh cranberries and lime wedges or slices. 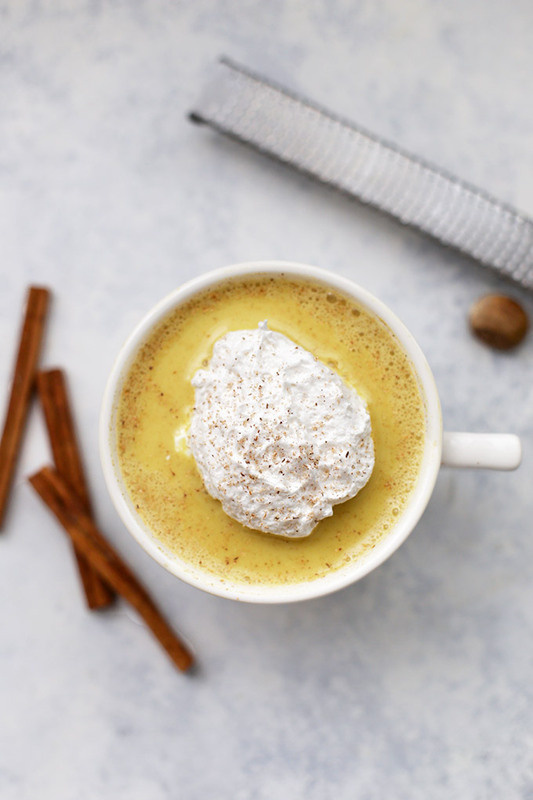 This is a healthier take on holiday eggnog. This one is completely vegan, lower in calories, naturally sweetened, and comes with an extra nutrient boost! I’ve combined it with another favorite drink–Golden Milk. I’ve taken the best of both drinks and blended them into something really delicious. You can enjoy this warm or cold, and it’s the perfect little something to sip this season. This one is made with Gaia Golden Milk. 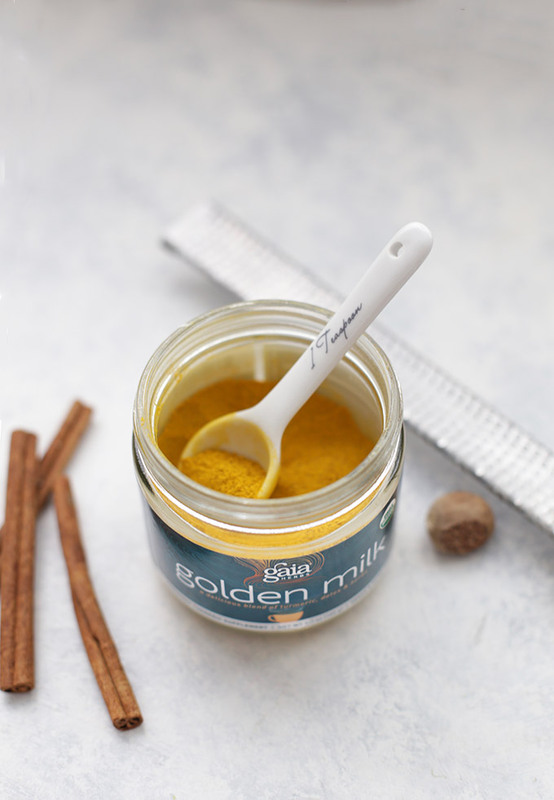 Golden Milk or “turmeric tea” is an Ayurvedic tonic that’s been used for centuries. It’s traditionally made with turmeric (which has anti-inflammatory properties), and is often flavored with things like cardamom, sometimes vanilla, and a little black pepper. The Gaia blend comes pre-mixed (without any weird additives), along with some dates for natural sweetness, and ashweganda-adaptogen which helps your body by boosting immunity, improving thyroid function, and fighting stress. Let’s talk turmeric. Turmeric is most often used in savory recipes (like curry), but it’s gaining a lot of momentum in sweet dishes, too. When I make straight golden milk, I use about 1 tsp of the Gaia blend, but for this nog, I use about 1/2 tsp per serving, to allow the nutmeg and cinnamon a chance to shine through. Turmeric works best with a little heat and a little fat, so I’ve used a little bit of coconut whipped cream, and the Gaia Golden Milk blend comes with a bit of black pepper already mixed in. (It’s not spicy, the pepper just helps activate the turmeric absorption for your body). If you’re not a coconut fan… you can leave it out. I’ve also tried this with about 1/4c soaked cashews blended into it (in my Blendtec) for some creaminess without the coconut. Also, as far as milk is concerned, you can use whatever kind of milk you prefer here. I use almond or cashew, but you could certainly use dairy milk if that’s what you like. Add ingredients to a mug and whisk to combine. Microwave 1-2 minutes, then whisk again. Let cool and top with a dollop of whipped coconut cream and a little freshly grated nutmeg. If you prefer it cold, simple refrigerate after whisking. (the heat helps distribute the turmeric/golden milk mixture more evenly). Combine the ingredients in a saucepan and warm on the stovetop, whisking until well combined. Serve with a dollop of whipped cream, or refrigerate until cold and top with whipped cream. Wassail is one of the most popular holiday drinks out there. This mulled cider is dressed up with festive spices and a little secret boost from greens. Keep it warm on the stove (or pop it in your slow cooker!) to greet you after playing in the snow, for sipping while wrapping presents, or cuddling up in front of a fire. You might not believe it when you taste it, but this wassail is boosted with greens! I used the Amazing Grass Pumpkin Spice Green Superfood blend and holy wow. It was stellar. My kids drank this like it was going out of style and it made my whole house smell incredible. 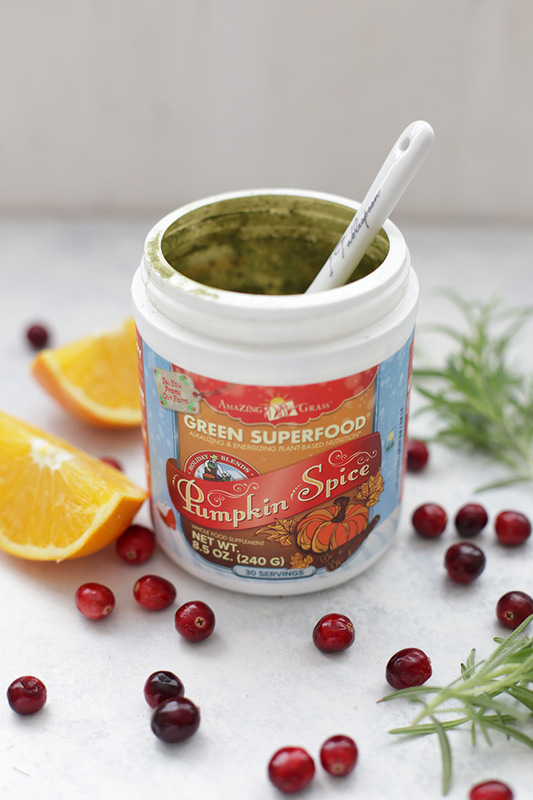 The Amazing Grass blends are made from some of the most nutrient dense grasses and superfood boosts on the planet, and while you might think they’d taste, well, grassy, this Pumpkin Spice blend tastes like the most amazing cup of spiced cider. They have a huge variety of flavors, so if pumpkin spice isn’t your jam, you can pick up some of the single-serving packs at Sprouts to taste a few flavors before stocking up on your favorites. Follow your tastebuds. If you’re just getting started with adding greens to things, you may want to start small. This is the perfect blend for adjusting your palate. Fitted with warm spices and a little bit of stevia, it adds so much to your cider blend! Try to use high quality juices for this if possible. They tend to have more natural sweetness and don’t taste as acidic or tart. Use that slow cooker! You can totally heat this up in the slow cooker if you’re serving a crowd or want to keep it warm. If you’ll be storing it a long time, you won’t want to add too many orange slices as garnish, as some of the bitterness of the orange peel can leach out. Instead, pop those orange slices in just an hour or so before serving. Double, triple, and more! This recipe easily doubles, triples, etc., so feel free to go big if you’re serving it at a party or gift exchange. 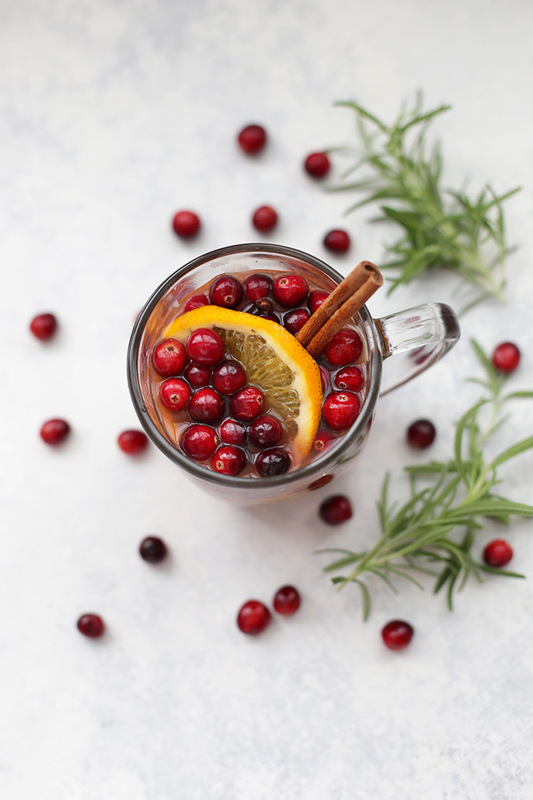 If you can’t find the pumpkin spice Amazing Grass blend, you can use 2 tsp of their original blend and add 1/2 tsp ground cinnamon, 1/4 tsp ground nutmeg, and about 1 tsp stevia to your wassail. Pour cider, orange juice, and cranberry juice into a saucepan. Whisk in the Amazing Grass blend. Add the cinnamon sticks and cloves. Bring to a simmer on the stove and add the garnishes–orange slices, apple slices, and cranberries. Keep warm to serve and stir a bit before serving. You can also make this in your slow cooker. Follow the same directions, just warm in the slow cooker instead of over the stove. Stir just before serving. 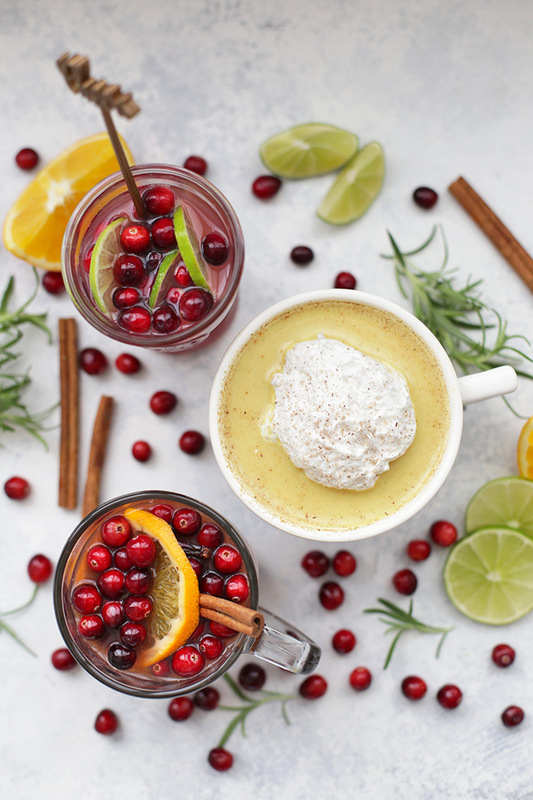 3 Superfood posted holiday drinks perfect for everything from a morning at home to your next holiday party. If you’re looking for a hot chocolate recipe, don’t forget to check out my homemade version (and video!) here. These all look incredible! My husband would LOVE the pomegranate one!